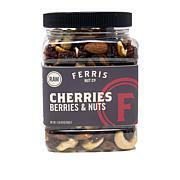 664-072 Ferris Coffee & Nut Co.
Juicy dried berries, plus the crunch of roasted and salted cashews, pecans and almonds. Keep this travel-friendly, satisfying snack on hand for any time of the day. 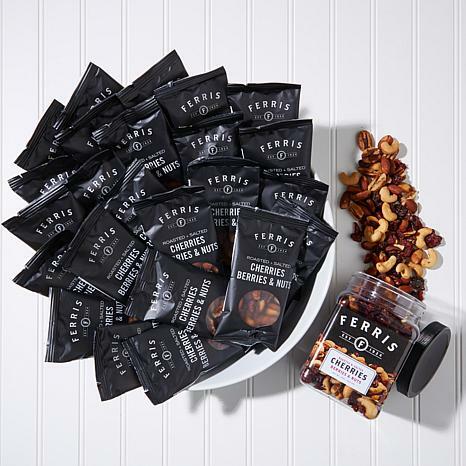 Contains cashews, almonds and pecans. Manufactured on equipment that processes product containing peanuts, tree nuts, wheat, soy, milk and egg. Unopened shelf life of 6 months. 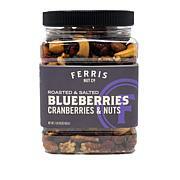 Ingredients: Cranberries (Sugar, Sunflower Oil), Cashews, Almonds, Pecans, Cherries (Sugar, Sunflower Oil), Peanut Oil, Salt. 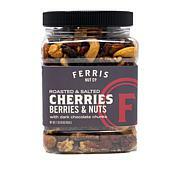 Ingredients: Cranberries, Cherries, Almonds, Pecans, Cashews, Sugar, Salt, Peanut Oil, Sunflower Oil. Actually theres one word that would describe this product, Fabulous you really dont want to miss this one. Wonderful mix & great taste. So handy to be able to take a pack along in your bag for a quick snack. This is the first time I am trying Ferris Company and I love it! It is a perfect snack for me! I would buy again. New year means new you. My husband an I were looking for a healthy snack pack an I saw these an decide to give them a try. WOW! 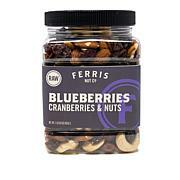 The nuts are perfect, great variety an the cherries an berries full of flavor moist texture an the touch of salt adds to sweet an savory with a little tartness. Packets are the perfect size to go anywhere, nutritional values are perfect. I never do the auto shipment thing but I wish these were available on auto ship. Packaging is simple an nice. Give them a try!